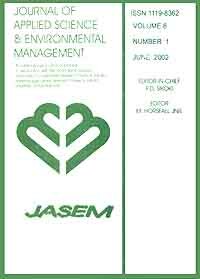 en Impact of effluent from gudu district sewage treatment plant on gudu stream in Abuja, Nigeria. Doughari, J.H. & Dodo, J.S. Gudu stream, the major stream providing water for Durumi 1, Durumi 2 and Durumi 3 settlements of Gudu District in Abuja, Nigeria was studied for impact assessment of discharged effluent from the Gudu District wastewater treatment plant. Studies on the physicochemical properties of the stream revealed high concentration of contaminants at the point of effluent discharge (IP) and upstream (USP). The effluent had no effect on the temperature of the stream at all points sampled (27°C). Bacteriological analysis revealed the most probable number (MPN) to be highest at USP (≥1800/100ml) and EP (≥1700/100ml), followed by that of DSP (1000/100ml) and the least value was obtained at IP (750/100ml). Escherichia coli , Salmonella typhi , S. paratyphi, Shigella flexnerri Klebsiella spp and Pseudomonas aerugenosa . Escherichi coli, Salmonella typhi, S. paratyphi, Shigella flexnerri were the prevalent bacteria isolated at all the points sampled.